Wouldn’t it be nice to watch the second season of “Homeland” without knowing the current headlines out of the Middle East – or President Barack Obama’s failed foreign policy blunders currently stoking the flames of outrage? Showtime’s taut terrorism drama returns at 10 p.m. EST tonight, and the show’s plot points sound terrifyingly close to the news downloading onto your iPhone. Israeli missile have pounded pounded Iranian nuclear targets, and the show’s scrappy heroine is tending to a garden, not scanning mission reports. Carrie Mathison (Claire Danes) is out of the C.I.A. and on her meds. She’s still reeling from wrongfully accusing former prisoner of war Nick Brody (Damian Lewis) of being “turned” during his captivity. Now, Nick is a popular Congressman with the trust of the nation. He’s in talks to be a vice presidential candidate in the upcoming elections, putting him and his spiritual leader, Abu Nazir (Navid Negahban), ever closer to the country’s most powerful office. Nick’s political career may seem limitless, but his family is starting to learn some hard truths about his current state of mind. Meanwhile, Carrie is called back into duty when one of her previous contacts offers up vital information with very little lead time. That means Carrie’s old boss Saul Berenson (Mandy Patinkin, a portrait of restrained fury), must look past her fragile emotional state and trust her instincts once more. “Homeland” quickly became awards bait – the show earned a Best Drama Emmy last weekend as well as acting kudos for Lewis and Danes. The first two episodes provided to the press suggest that likely won’t end any time soon, but there are some caution flags fluttering in the breeze. Danes’ Carrie is a fascinating counter point to TV’s other terrorist warrior, “24’s” Jack Bauer. Both bring a bruised emotional state to their work, and Danes’ curious blend of beauty and inner strength give her a dimension Kiefer Sutherland’s performance lacked. But Danes’ wide-eyed stares are already exhausting after two new installments. She looks possessed. Even a rookie C.I.A. agent might not let her watch the office goldfish let alone take on assignments which could get soldiers killed. Lewis’s character walks a similar tightrope. Watching him twitch during stressful moments feels like the equivalent of a silent movie villain twirling his moustache. We’re only in season two, but the show’s soapy elements are pushing uncomfortable close to the fore. Where “Homeland” unabashedly succeeds is during its tense moments, like when Carrie shoves protocol aside to get more information on her informant. The move puts her colleagues in danger, and the sequence’s sharp execution makes every bullet ricochet count. 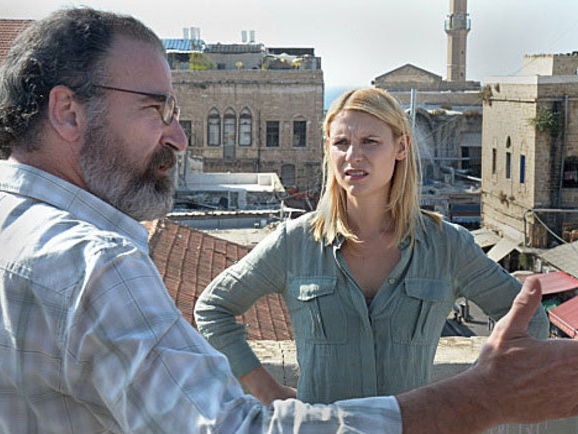 Those just joining “Homeland” may not be sold on tonight’s episode alone. The new storylines, which offer a multitude of promise, are just grinding into gear. Stick around. Next week, the show rediscovers why it’s Showtime’s most addictive drama to date.